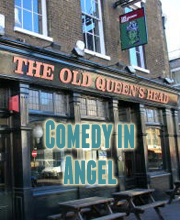 Another FREE comedy night at the Camden Head, Camden, brought to you by Laugh Out London. We’re back on Friday June 1st, with doors to open at 8pm for an 8.20pm start. The darker side of sketch comedy, Casual Violence return with their macabre brand of inventive comedy. Class new act and an award winner already in his brief career. Charming, tall, bearded and funny. What more could you want? Some reviews to prove it? Okay. One of our very favourite acts, with wonderful stories of Neil Buchanan, the Honey Monster and Disney films with questionable soundtracks. A regular at Josie Long’s Lost Treasures of the Black Heart, and a finalist in the Hackney Empire New Act competiton in 2010. Host of political comedy night Lolitics and a man with as much passion for activism as puns about bread.